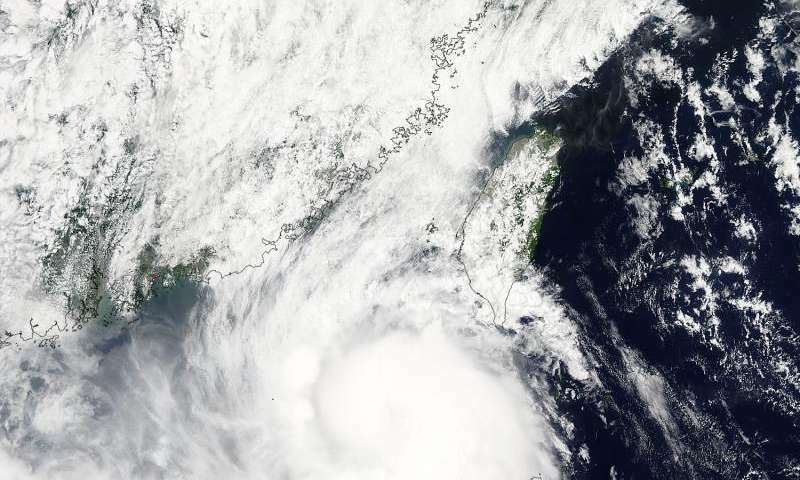 NASA's Aqua satellite captured a picture Tropical Storm Linfa in the South China Sea on July 7 when it was between southern Taiwan and the northern Philippines. Aqua passed over Linfa on July 7 at 05:25 UTC (1:25 a.m. EDT) and the Moderate Resolution Imaging Spectroradiometer or MODIS instrument captured a visible image of the storm. Bands of thunderstorms wrapping into the center of circulation from the south, draped over western Luzon. The MODIS image showed the tight concentration of thunderstorms around Linfa's center were located over the South China Sea. Fragmented bands of thunderstorms north of the center were brushing over Southern Taiwan while clouds from another band of fragmented thunderstorms stretched northwest through the Taiwan Strait. On July 7 at 1500 UTC (11 a.m. EDT), Tropical Storm Linfa's maximum sustained winds had increased to 50 knots (57.5 mph/92.6 kph), up from 45 knots (51.7 mph/83.3 kph) six hours before. Linfa strengthened in the warm waters of the South China Sea now that its center has moved away from the northern Philippines and was no longer over land. Linfa was centered near 21.0 North latitude and 118.8 East longitude, about 277 nautical miles (319 miles/513.3 km) east-southeast of Hong Kong, China. Linfa has tracked northward at 3 knots (3.5 mph/5.5 kph). For updated warnings and watches from the China Meteorological Service, visit: http://www.cma.gov.cn/en/WeatherWarnings/. Linfa is moving north between Luzon and Taiwan. The Joint Typhoon Warning Center expects Linfa to strengthen to 60 knots (69 mph/111 kph) by mid-day on July 9, before weakening and then making landfall in mainland China.